You might have seen us recently posting a bit about our new reports module, and how we had started to track property views on the estate agency WordPress websites that we power. Today sees us take this one step further by importing statistics from Rightmove. 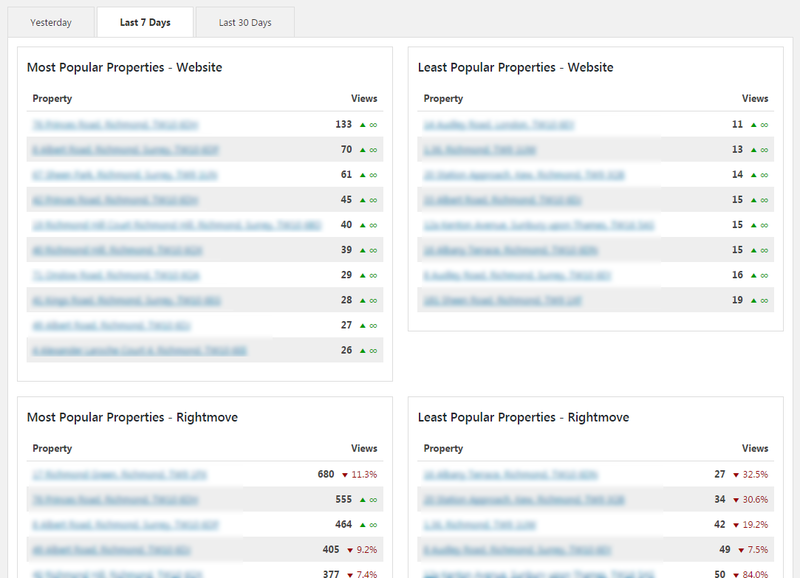 If you already use our RTDF (Real-Time Data Feed) Add On you’re probably already exporting your properties to Rightmove. If this is the case you can now also begin to automatically import statistics from Rightmove too. These statistics include how many times each property has been viewed on the property portal and will be displayed on our recently released Property Popularity Report which shows the most and least popular properties. These imported statistics will be displayed alongside the existing statistics gathered from the website, and will show the increase or decrease in views compared to the previous timeframe. To begin gathering these stats you can simply purchase the RTDF add on. If you’re an existing user of the add on, assuming you have a valid license key you’ll be able to update through WordPress. Once installed you can navigate to ‘Property Hive > Settings > Real-Time Feed, edit the existing portal and enter the API URL where the statistics should be obtained from. Once the URL has been entered, statistics will start to automatically import once per day and will obtain data from the past 28 days. In the next few weeks we’ll be displaying all of these available view statistics, and more, on the individual property records within WordPress so you can see how each individual property is performing, and even use this to feedback to the owner or landlord.